Welcome to Magic Digitals. Thank you for visiting my private site. I am glad that you too are interested in digital watches. 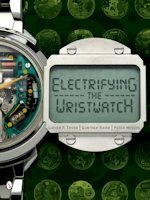 On the pages of this site, I present beautiful examples of electronic watches – many of which are masterpieces in watch history. My selection is limited to the years between 1972 (the first LED watch) and 1979 (the first fully electronic analogue watch). I chose this time period because this is when the most significant developments occurred in the field of electronic watches with digital displays. You will see examples of LED and LCD watches, as well as rarities like watches with dynamic scattering and pseudo-analogue display. I'll also show you watches out of my collection from which I am selling (both directly on my for sale site and through auctions). For confidence please have a look on my references. This site will feature hints and tips for maintenance, adjustment, and repair. I am specialized in repairing early electronic watches, especially Omega, Pulsar, Breitling Navitimer, Heuer Chronosplit, Bulova Accutron and others. Please feel free to contact me in case you need assistance. Feel free to contact me if you would like to chat about this interesting field. Now, have fun by surfing on Magic Digitals. Unfortunately the english version is still under construction and not all pages are available. But please feel free to click through the menu and have a look on the pictures. Hope, you enjoy!